When it’s time to re-roof the residences of your homeowners association or community, we can help. With multiple, durable, long-lasting and beautiful options, we provide expertise and quality roofing for Homeowners Associations. Metal roofing today is available in many styles, profiles, and colors. These products catch the eyes of homeowners looking for a way to not only beautify their homes, but add significant value as well. Isaiah Industries is the industry leader in beautiful residential metal roofing. 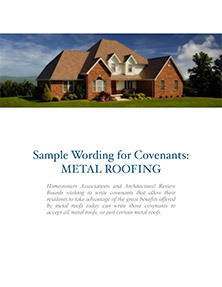 We are here to work closely with you and will be happy to come present the benefits of beautiful residential metal roofing, to Homeowners Associations, Condominium Boards, and Architectural Review Boards, across the United States.